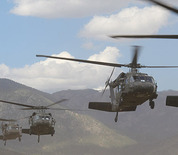 Fort Carson is located near Colorado Springs, Colorado and is home to the 4th Infantry Division, the 10th Special Forces Group, the 440th Civil Affairs Battalion, and the 71st Ordinance Group, among many other units. Reserve units for the Army, Navy and Colorado Army National Guard also conduct operations from Fort Carson. The beautiful scenery of the surrounding area make Fort Carson the second most requested duty station in the Continental United States. Colorado Springs is located at the base of Pikes Peak and the Rocky Mountains. This Fort Carson directory features the critical info you’ll need to navigate through the many facilities and recreational opportunities available on base­­.